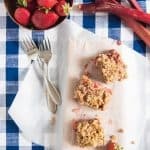 The sweet tart combo of strawberries and rhubarb with a buttery streusel crust and topping make these strawberry rhubarb crumb bars so, so, so delicious. My parents are certified master gardeners and in their backyard at their house in Utah, they have a rhubarb plant. So when I was visiting a couple of years ago and learned that they never actually do anything with the rhubarb that they grow, I decided that something just needed to be done about that and I made my first ever strawberry rhubarb crumble. Which we all loved, and my dad told me that strawberry rhubarb is one of his favorite flavors, which I never knew about him. I love knowing little details like this about my dad. 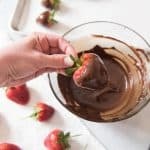 Like how I also know that there are two other desserts that he always says are his all-time favorites whenever we make them for him – strawberry shortcake and homemade chocolate cake with seven minute icing. 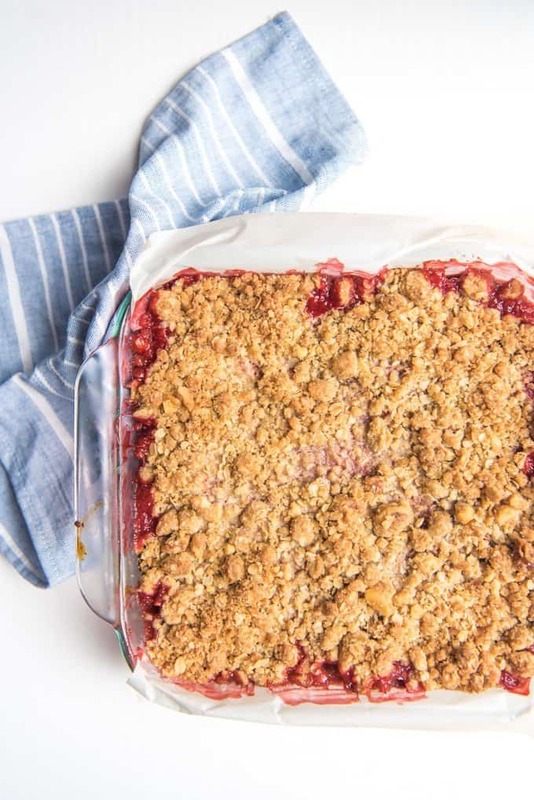 But first, we definitely need to talk about these strawberry rhubarb crumb bars that are rocking my world. Since this weekend was Father’s Day, and since I finally was able to track down some rhubarb (I don’t know why it was so hard to find this year! Every time I went to the store they were out! 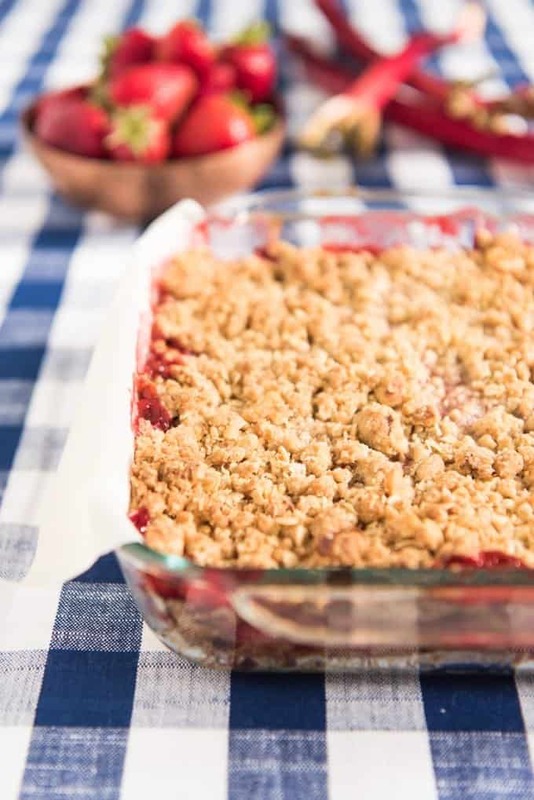 ), I decided to do a variation on the crumble I made for my dad that first time I cooked with rhubarb and I made strawberry rhubarb crumb bars instead. And they were wonderful. Like, wwwonnnnddderrrfullll. I kept finding excuses to walk back through the kitchen to cut off just another sliver. And then another. 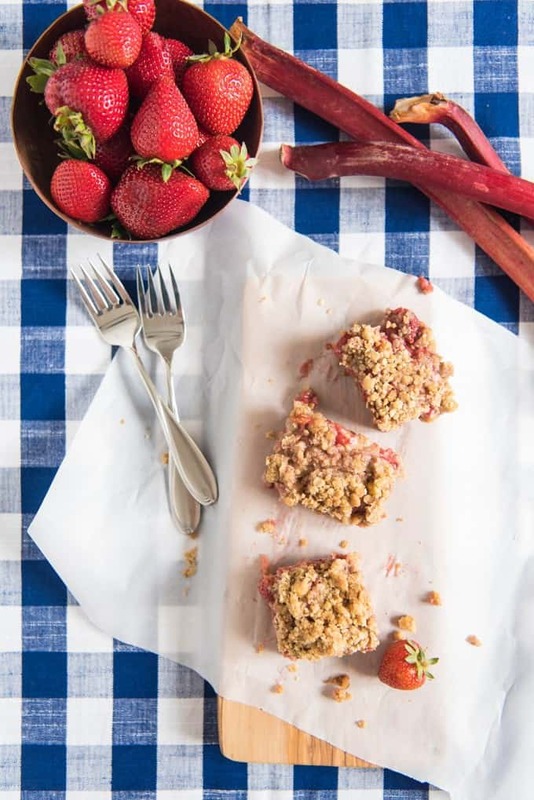 I lurve adding walnuts to the crumb mixture for these strawberry rhubarb crumb bars because 1. I love nuts. I have an entire drawer in my freezer where I keep almonds, walnuts, pine nuts, macadamia nuts, and pecans all for baking. And 2. because walnuts and strawberries are a match made in heaven in my book. If you have never had them together, oh boy, you don’t know what you have been missing out on. Another recipe I need to post when I get around to it is from my award-winning strawberries & cream pie with a walnut shortbread crust! Gah. 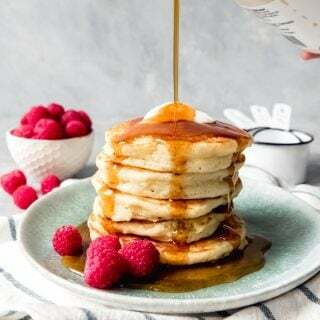 Starting a food blog is a ton of work, especially when there are so many amazing recipes to choose from to make and post about! If you don’t love nuts like I do, it’s okay. We can still be friends. These bars are amazing without them, too, so never you fear. Oh, and let the bars cool before you cut into them or you will have a goopy mess from the cooked fruit. But then feel free to heat it back up just a bit and serve with a scoop of ice cream if you want. Although weirdly, I just can’t get enough of these just as they are, no ice cream necessary. Which says a lot about how I feel about these bars. Happy Father’s Day! 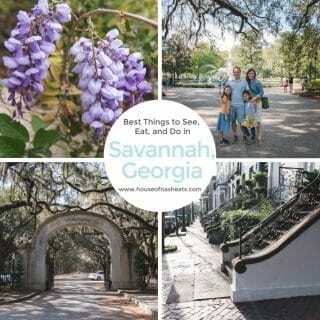 Be sure to follow House of Nash Eats on Facebook for more recipe inspiration! Preheat oven to 350 degrees. 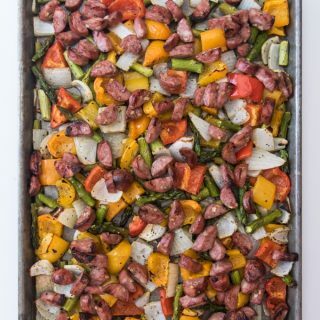 Prepare a square 9x9" baking dish by lining it with parchment paper so that the bars will be easy to remove and cut once they have cooked and cooled. Or just spray it with cooking spray if you don't have parchment paper on hand. In a mixing bowl, combine the flour, oats, soda, salt, sugars and walnuts. In a separate bowl, stir the vanilla into the melted butter, then add to the butter and vanilla to the oat mixture and stir to incorporate. When the crumb mixture is evenly moist, press 2/3 of it into the bottom of your prepared baking dish. Set aside the remaining 1/3 of the crumb mixture for the top layer. In a separate mixing bowl, combine the chopped strawberries and rhubarb. Toss with the lemon juice, then add the sugar and cornstarch and stir to coat the fruit. 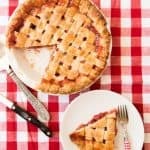 Pour the strawberry rhubarb mixture evenly over the the bottom crumb layer, then sprinkle with the remaining 1/3 crumb mixture. 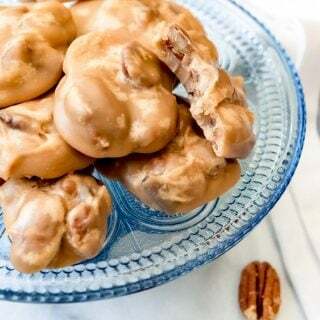 Bake in the preheated oven for 45-50 minutes, until the top is golden brown and the filling is bubbling. Remove from oven and allow to cool completely before cutting into bars. 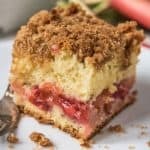 I have always been intimidated by working with rhubarb but this dessert looks too darn good to pass up! I’m going to have to get over myself and make this. It’s not bad at all! Just like working with celery in recipes, really! 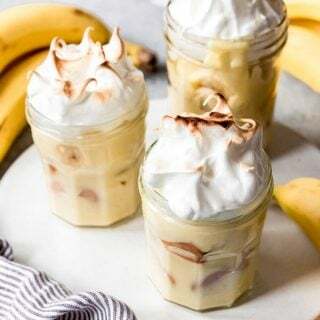 These look like a really tasty afternoon snack! And I need to use rhubarb more often! 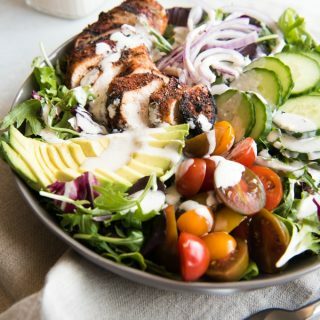 This is a combination I love and I’ve always wanted to make but never did. 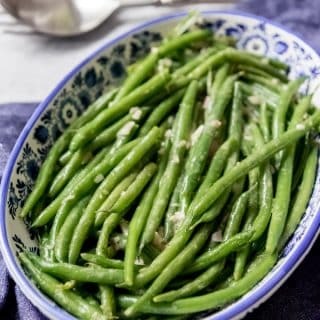 Thank you for the inspiration and the recipe! Absolutely! 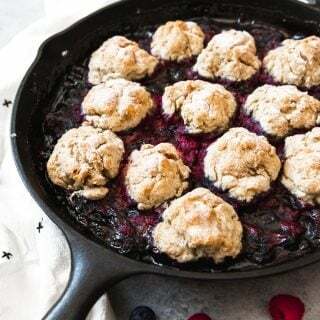 I actually often buy extra rhubarb while it is in season and cut it up to freeze it so I can make these later in the year!